Hunter Barrington has been advising private clients and arranging their assurance and investment schemes since 1986. 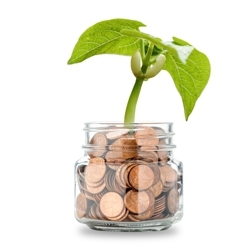 We currently oversee more than £40,000,000 in investment funds on behalf of working investors seeking growth, retired investors seeking income and trustees and beneficiaries of inheritance trusts. We also have in place many millions of pounds in sums assured under life and income protection policies. We commit ourselves to serving our clients’ needs and financial interests over the long term and many of our investors have been with us for 20 years or longer. We are also proud of the fact that we now also serve our clients’ children and even their grandchildren. Hunter Barrington does not advertise and its new clients come via introductions from satisfied existing investors. As well as having our own office and dedicated staff in Bristol, Hunter Barrington is a member (Appointed Representative) of a financial intermediary organisation, Lighthouse Advisory Services Ltd (LAS). LAS is a network of community-based financial advisory firms which provide individuals and businesses throughout the UK with solutions for their wealth management needs. 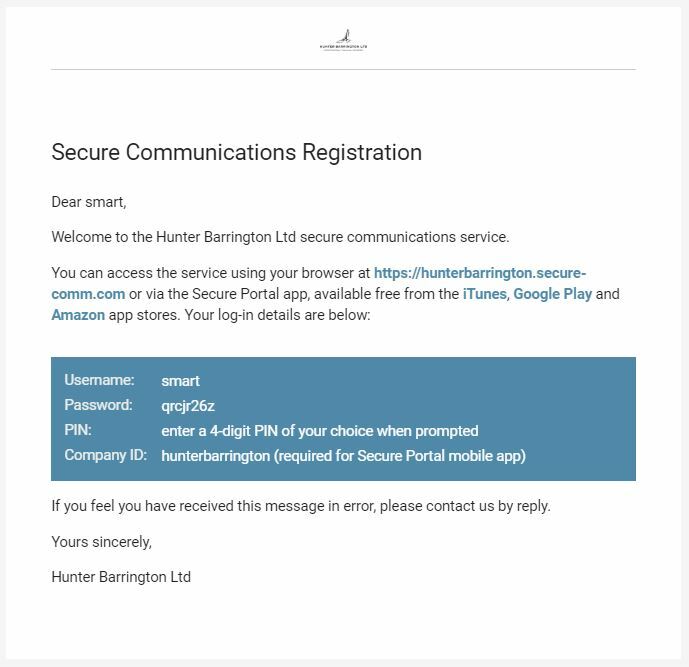 So our clients are comforted by the fact that whilst they receive personal and close attention from a small family firm, Hunter Barrington, they also have the resources of a national company in support. For their further peace of mind our investors are reassured in knowing that LAS is part of the publically quoted financial services company, Lighthouse Group plc. In all its constituent parts, Lighthouse is one of the UK’s largest financial advisory organisations. We have chosen not to advice our clients on other types of investments such as those which are bought directly from a stock market and not via a fund: publically quoted shares, Investment Trusts and Exchange Traded Funds being examples. However, where managers think fit (and potentially profitable), all of these immediately preceding types of investments may form part of our carefully selected collective funds which we offer to our clients. Equally, we have chosen not to offer higher risk schemes such as Venture Capital Trusts, Enterprise Investment Schemes and Structured Investments. As Hunter Barrington chooses not to advise on certain types of investment, it is deemed to offer what is called ‘restricted advice’ by our regulator, the Financial Conduct Authority. However, we must not be confused with firms which are strictly limited to arranging investments into the funds of a single company, including such companies which employ a number of external managers to run their in-house funds but still own-label their offerings. Hunter Barrington is not tied to one fund company or a circumscribed number of funds. We have access to all the major, and the smaller, fund houses and to over three thousand different funds from which we may choose in order to satisfy our clients’ needs and financial ambitions. We do not advise on personal debts (what is called ‘debt counselling’) and Hunter Barrington does arrange mortgages and other types of loans. When advising on or arranging funds, we remind our clients that investment is a medium to long term affair, for patient and cool-headed souls, and that the values of investment funds certainly do rise and fall. Particularly at short term price points, investment values may be lower than starting values and clients should always have available to them sufficient cash resources for their short term or emergency needs. Barry is the advising director at Hunter Barrington Ltd. He started his working life as a post-graduate qualified teacher and switched to financial services in 1984. He is approved as an adviser by the Financial Conduct Authority (FCA) and holds the required professional qualifications. Barry is a member of the London Institute of Banking and Finance where he has been awarded a Statement of Professional Standing. He is also a member of the exclusive Lighthouse Pharos Club. This invitation-only group recognises members associated with the organisation who are not only the most successful in terms of their volume of trade but who also provide the highest standard of advice and service. Barry attributes the success of Hunter Barrington to the fact that the company always puts the long-term interests of its clients and their families first and foremost. Lizzie Mumford holds an approval from the FCA to act as an administrative director of Hunter Barrington. Qualified in secretarial skills, she has been looking after our clients since 1984 and knows many of them very well. In an age where impersonal and robotised business relationships are more and more dominant in financial services, Lizzie brings a warmth and understanding which clients appreciate when dealing with us. Lizzie equally shares Hunter Barrington’s commitment to serve our clients to the best of our ability. Kerry Mumford also holds an approval from the FCA to act as an administrative director of Hunter Barrington and she compliments Lizzie Mumford’s role in the business. Kerry achieved a higher education qualification in travel and tourism and worked in that business before joining us. She has been with the company for the past sixteen years and, amongst her other tasks, she runs the back office systems. Like Lizzie Mumford, Kerry is well-known to many of our clients and equally brings a human touch to our dealings. Kerry has an excellent reputation amongst our clients as a fixer. That is to say, when investment and assurance providers get things wrong, as sometimes they do, Kerry is very effective in putting matters right. Abi has been with Hunter Barrington for two years, having left school with a good crop of higher level exam grades. She is an assistant to Kerry Mumford and is highly skilled in IT and social media. With an excellent eye for detail and the ability to learn quickly, under supervision Abi takes care of some of the paperwork and electronic load which flows through the Hunter Barrington office. Hunter Barrington Ltd is a network member (Appointed Representative) of Lighthouse Advisory Services Ltd (LAS), which is part of Lighthouse Group plc. LAS provides Hunter Barrington with many support services, including dealing with Professional Indemnity Insurance and with the regulatory and compliance requirements of the FCA. Lighthouse Group has been delivering financial solutions for many years, evidencing an ability to look after clients not just during thriving economic climates but also through more difficult times too. Being a listed business on the AIM market means that Lighthouse’s financial strength and longevity are there for all to see. More than just an organisation with an esteemed reputation and a noteworthy customer base, Lighthouse is profoundly interested in the security of its clients’ financial futures. The company is committed to delivering expected investment outcomes, within appropriate investment risk frameworks. Connecting with us as local Lighthouse advisers benefits clients in having the personal touch brought by a family firm together with the reassurance and financial resources provided by a large, supporting network. More and more, financial services businesses are driven by, and heavily rely upon, electronic means which need to be keep up to date in both information processing and data security developments. Hunter Barrington recognises that specialist firms deliver the best IT results for itself and its clients. For this reason, the company contracts with two independent local companies, Smart Insight and CAB IT, to deliver and to maintain the highest standard of electronic services and equipment. For your protection we use a Secure Email service that encrypts any information that we send to you. 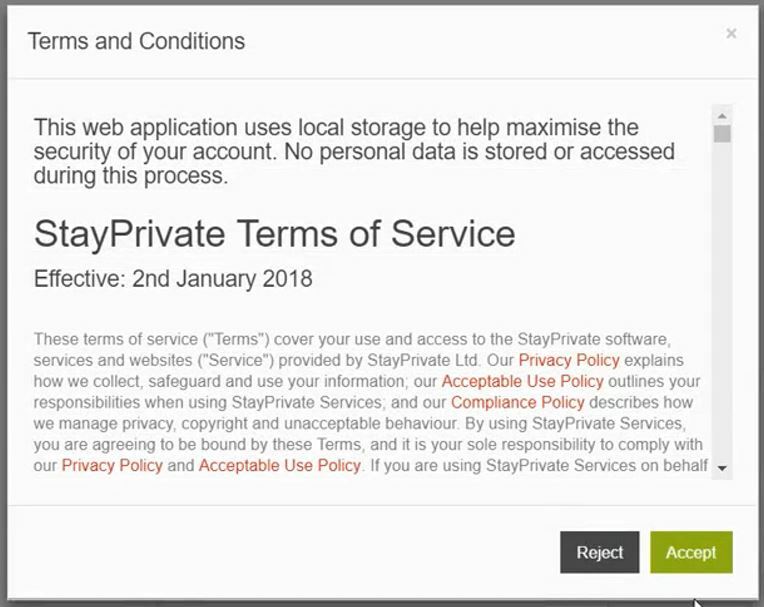 The service is called "STAY PRIVATE". The first time that you receive an email from us, you will have to set up a 4-digit PIN number that you will use to open any subsequent emails. 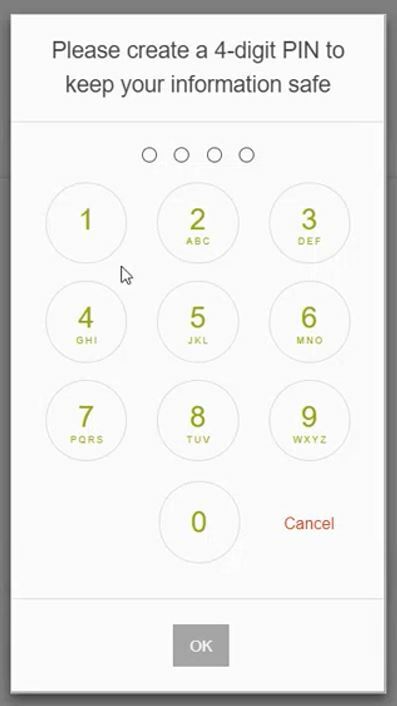 Enter a PIN number of your choice when asked. You do not have to enter any password when asked. 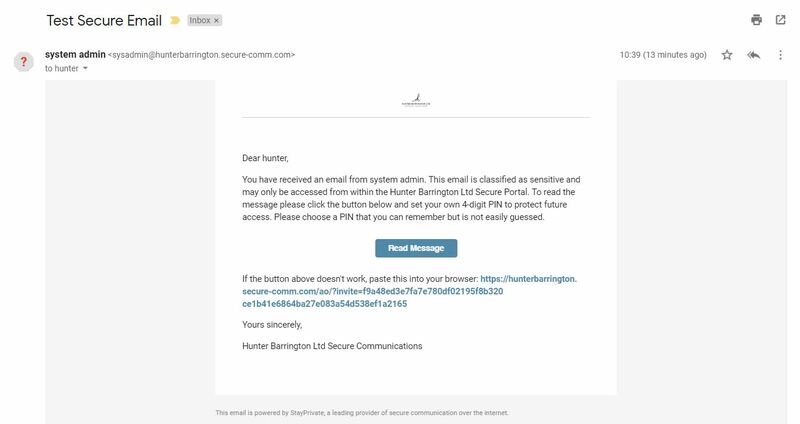 We recommend that you use this system to reply to any emails that we send you that contain sensitive information. To reply to an email securely, please click the "reply" button, write your email in the space provided and click send. A copy will be stored in your secure email account. You can also send us a new email using the system. Please call us on 01275 393020 if you need any further help. We may ask our IT provider to call you back, they may ask you to click on this link which will download a piece of software that will allow them to view your screen so that thay can see what is causing the problem. 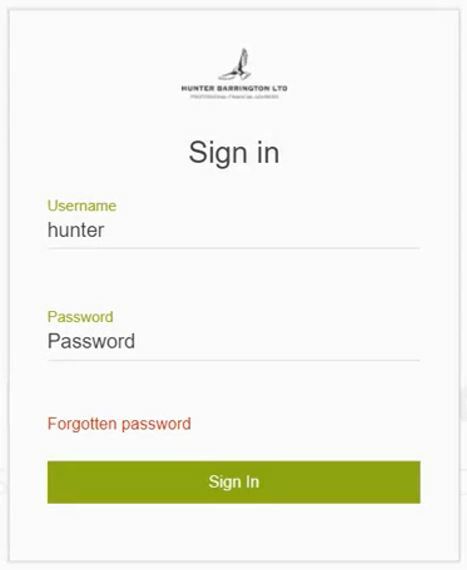 Hunter Barrington Ltd is registered in England and Wales Number 02445662. Registered office as above.